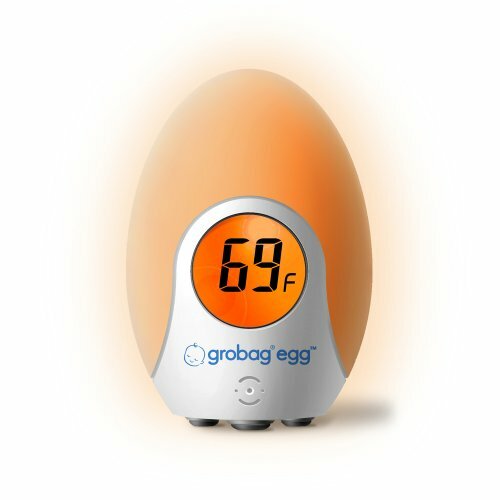 The Grobag Egg color changing digital room thermometer is another clever innovation from the people who brought you Grobag baby sleeping bags. The correct temperature is vital for creating a safe sleeping environment for baby. Health professionals recommend that the room your baby sleeps in should be maintained between 61 and 67 degrees to help reduce risk of Infant Death Syndrome. The Grobag egg glows yellow if the room temperature is within the recommended guidelines. If the room temperature is outside the range, the grow egg will glow a different color. Comes with a power adaptor. 4" x 2.5" x 2.5". Every babys home should have a Grobag Egg room thermometer and it is ideal for use with Grobag baby sleeping bags to help you to monitor the temperature of the room where your baby is sleeping. This is the best purchase we've made for our baby yet! Only reads ONE temperature, 77 degrees!